I'm pretty happy to be part of a the book tour for Hit. I got really excited when I realized the author, Lorie Ann Grover, is one of the founders of readergirlz.com. If you haven't heard of readergirlz, you need to go check them out pronto. This fabulous group of ladies promotes teen literacy is some pretty amazing ways. 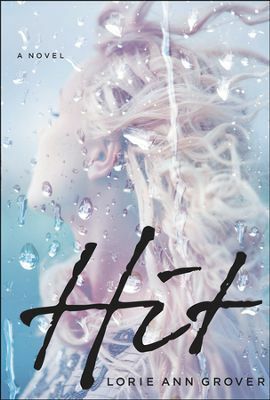 Hit is the second book by Lorie Ann Grover that I have read. I read On Pointe during the summer. I've noticed that both books have a very easy flow to them, which makes them great for younger (teenage) readers. After receiving a full-ride scholarship to Mills College for Girls, it appears Sarah's future is all laid out before her that is until she walks into a poetry class led by Mr. Haddings, a student teacher from the nearby University of Washington. Suddenly, life on the UW campus seems very appealing, and Sarah finds herself using her poetry journal to subtly declare her feelings for Haddings. Convinced Mr. Haddings is flirting back, she sets off for school in the rain with a poem in her back pocket one that will declare her feelings once and for all. But everything changes when Mr. Haddings feels a thud on his front bumper when he glances away from the road, and finds Sarah in the street with blood pooling beneath her." Aside from a stellar cover, what can you expect from Hit? The answer to the story is both simple and complicated. On the basic level, you have a pretty horrific accident that wrecks havoc on the lives of a family. Sarah is a senior with everything going for her. She's beautiful and talented. Unfortunately for her, she develops feelings for the student teacher visiting from the local college, Mr. Haddings. The reader never really gets a clear picture of whether or not these feelings were reciprocated, but something is certainly afoot. There is a lot-- and I mean a lot-- of ambiguity in this area. When Haddings realizes he's hit Sarah, it's not just his windsheild that shatters. This man finds himself knee deep in a mess that he will never escape. Sarah's best friend Cyndi is quick to paint a less than ideal image of Hadding's motivation to hit Sarah. But it's left up to the reader to decide whether she's right or not. I liked the story itself. It was certainly gripping enough to keep me turning the pages. You can tell the author did a great deal of research to make Sarah's experience in the hospital as realistic as possible. At times, it was pretty gruesome for my weak stomached self. The story alternates between Sarah and Haddings' points of view. While Sarah spends a large part of her time unconscious in the beginning, she seems to be the one with the most insight. Haddings had a small part to play upfront but then his character seemed to fade away. He just wasn't as strong as I'd expect him to be. The two characters that really stood out to me were the parents. I don't think they were meant to be the focus, but it ended up that way for me. The mom has issues, obviously. I would think for a parent facing her children growing up and moving on, there is some struggle with the "empty nest syndrome". It would have to be a hard adjustment to make to see the person you've spent the majority of your life taking care of move on without you. That's where Sarah's mom finds herself until suddenly she's given that second chance to take care of Sarah. You see a very vulnerable side to the needs of a parent struggling to find a place outside of her child. Then there is the dad. I think I liked him the most of all because he was dealing out the life lessons. He's a man of faith that is struggling with forgiveness, and rightfully so. I really liked his lines about hope and forgiveness. There were some powerful messages coming from his character. Overall, I enjoyed Hit. It was a very quick read that kept me reading from the start. I felt like some of the characterization for Haddings could have been fleshed out a bit more, but I chose to focus more on the secondary characters as I read. I think this enhanced my reading experience, and kept me from focusing on things that I would have wanted to see changed.